Your life expectancy grows, the more anabolic – and fewer catabolic – hormones your body produces. Researchers at Harvard Medical School reached this conclusion after performing a molecular-epidemiological study on 925 men and women over the age of 54. The researchers used data that had been gathered in the Taiwanese Social Environment and Biomarkers of Aging Study. For that project scientists measured the concentration of the hormones IGF-1, DHEA and cortisol and the inflammatory protein interleukine-6 in the blood of 925 Taiwanese people. They also measured the length of the telomeres in DNA of the subjects' white blood cells. 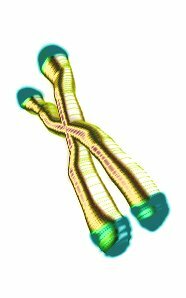 The shorter the telomeres, the shorter the amount of time you probably have left to live. The less IGF-1 and DHEA they had in their body, the shorter the participants' telomeres were. IGF-1 and DHEA are anabolic hormones. The relationships were not statistically significant, though. The more cortisol they had in their body, the shorter the participants' telomeres were. Cortisol is released in large quantities under conditions of physical and psychological stress, and has a catabolic effect. But this relationship was not statistically significant either. The researchers then looked at the relationship between the anabolic hormones [IGF-1 and DHEA] and the catabolic cortisol [A/C imbalance summary]. The relationship between this ratio and the length of the telomeres was statistically significant. "In summary, in this population-based study of older Taiwanese adults, we found that high IL-6 levels were associated with short telomere length, and a higher A/C imbalance summary measure was associated with greater odds of having a short telomere length", the researchers write. "Efforts to address anabolic and catabolic biochemical levels in clinical settings may contribute to our ability to detect the adverse health conditions associated with telomere length and potentially identify mechanisms to diminish and treat the consequences linked to these conditions." The researchers are concerned with people suffering from depression, but their results may also be of interest to athletes. Might athletes who over-train on a long-term basis be shortening their lives? And mightn't interventions that reduce the synthesis of cortisol or boost the synthesis of anabolic hormones help extend athletes' life expectancy? f you are physically very active, the chances are your genetic material is ten years younger than it would be if you spent your life as a couch potato, researchers at King’s College London conclude in the Archives of Internal Medicine. f you take a multivitamin and mineral supplement regularly you're likely to live ten years longer. At least, you'd think so if you read a study from the University of Utah, published in the American Journal of Clinical Nutrition. The more vitamin D in your body, the younger your DNA is, researchers at the London School of Medicine suggest in the American Journal of Clinical Nutrition.